Ashley and I recently had the chance to visit the Salton Sea State Recreation Area in Southern California. The Salton Sea was a really fun unique place to visit and we incorporated this trip into our second anniversary wedding weekend trip to Palm Springs. The Salton Sea was created by a flood in 1905, in which water from the Colorado River flowed into the area for a year and a half. While the Salton Sea varies in dimensions and area with fluctuations in agricultural runoff and rainfall, the Salton Sea averages 15 miles by 35 miles. With an average area of roughly 525 sq miles, the Salton Sea is the largest lake in California. For more pictures make sure to check out our Facebook Page. Directions to the Salton Sea: The Salton Sea is located in Southern California and is surrounded by highway 86 and highway 111. There are many points of interest around the Salton Sea with different addresses. The Salton Sea Visitor Center is located at 100-225 State Park Road, North Shore, CA 92254. 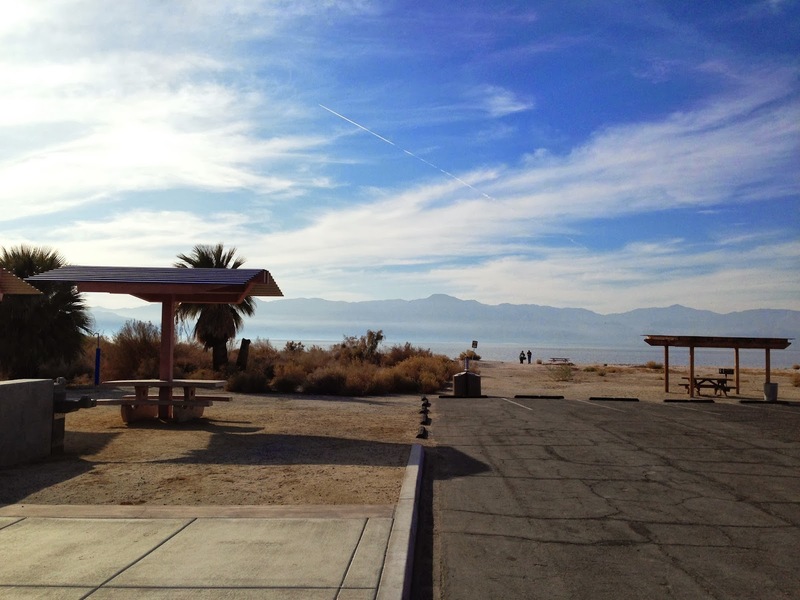 The Salton Sea Visitor Center is the best place to start when visiting the Salton Sea. You can find information on multiple points of interest around the Salton Sea such as Bat Cave Buttes, Bombay Beach, Hot Mineral Spring Road, Salvation Mountain, Slab City, Mud Volcanoes and Mud Pots, and Obsidian Butte. Additionally, there are things to see and do while at the Visitor Center and the Ironwood Nature Trail starts close to this area. 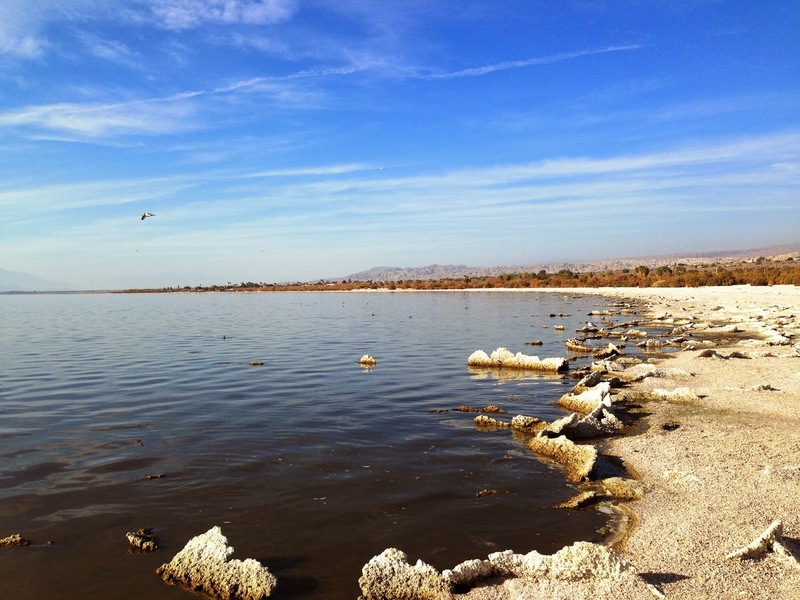 There is a day use fee of $5.00 for hiking/exploring the Salton Sea State Recreation Area. RV Hook-ups are $30.00, Camping is $20.00 and launching a boat into the Salton Sea Costs $3.00. 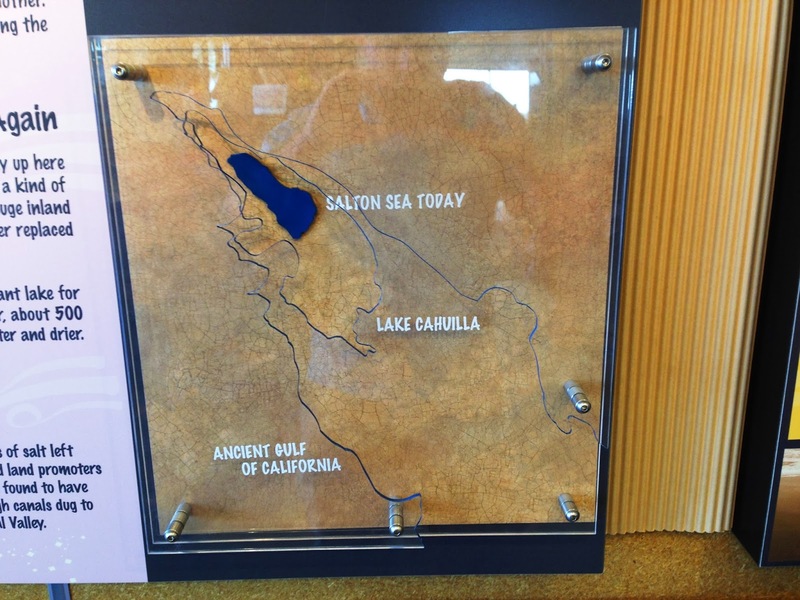 For a map of where the Salton Sea Visitor Center is located, click Here. Description of Trail: During our time visiting the Salton Sea we explored Bombay Beach (Which is presently closed), visited Salvation Mountain and Slab City, and explored the Ironwood Nature Trail. The Ironwood Nature Trail goes from the Salton Sea Visitor Center to Mecca Beach (2 miles round trip) and to Corvina Beach (4.5 miles round trip). Elevation gain on this hike is under 50 feet total. This is an out and back hike on a dirt/barnacle trail. 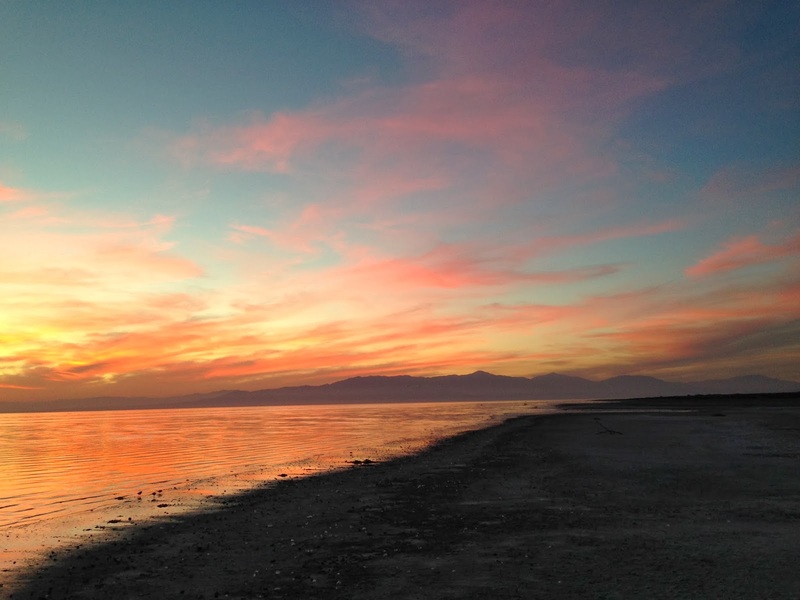 Hiking in the Salton Sea State Recreation area is best done during the Fall, Winter, or Spring. During the summer time temperatures routinely soar to well above 100 degrees Fahrenheit and prolonged hiking in that environment is neither particularly enjoyable and can become dangerous. If you attempt a hike in this area during the summer or other warm times, make sure to bring plenty of water, have proper clothing, and wear sunscreen. This is a relatively exposed trail and there is little shade, so be prepared for the elements. The Ironwood Nature Trail, however, is a unique pictures trail around a very small portion of one of Southern California's most unique water features. For a brochure of the Salton Sea, click Here. Further Thoughts: Ashley and I enjoyed exploring the Salton Sea State Recreation area and really wished we had more time to explore this vast expanse of land than just a day. We enjoyed our hike around the Ironwood Nature Trail as well as exploring the Visitor Center. We also got the chance to watch a beautiful sunset from Bombay Beach. 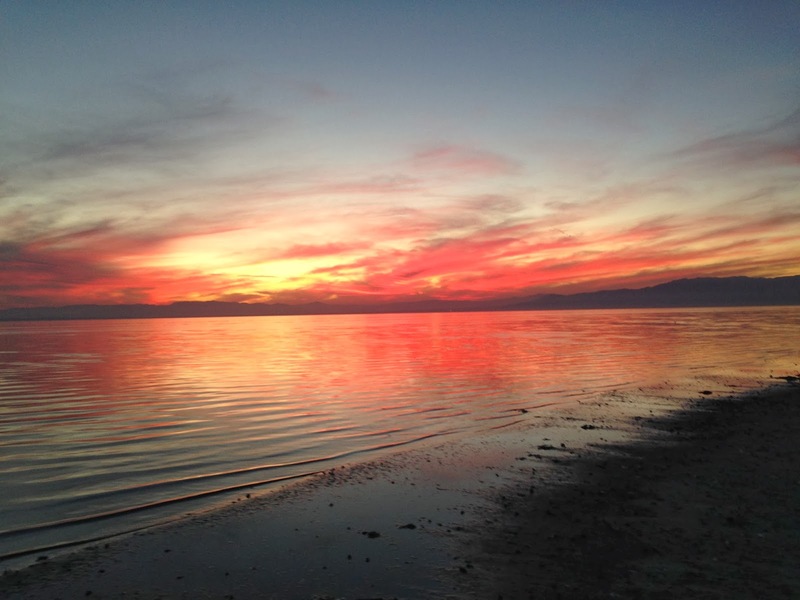 If you are looking for spectacular sunsets the Salton Sea will not disappoint. The shoreline around the Salton Sea is mostly composed of crushed barnacles. The barnacles arrived at the Salton Sea during world war two because military sea planes would regularly land at the Salton Sea, thus bringing with them barnacles with them. The barnacles ended up flourishing in the Salton Sea environment. 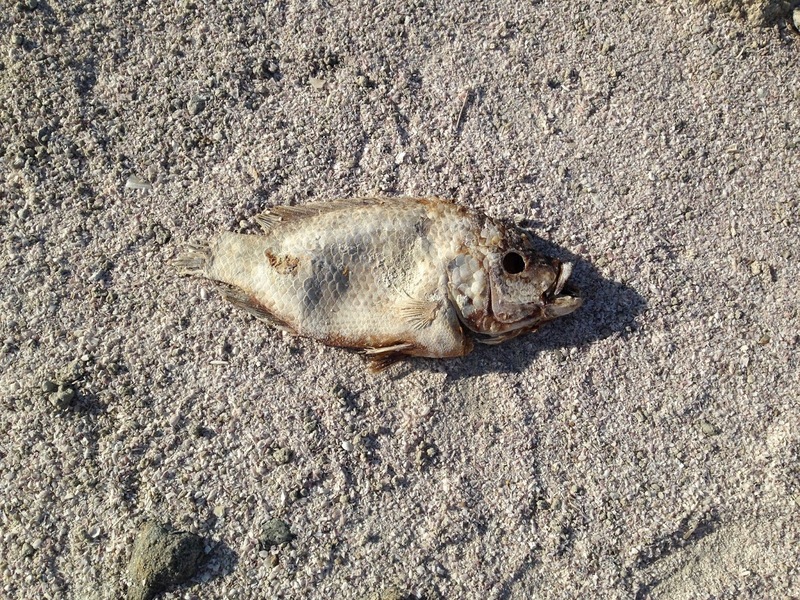 Another thing you will notice while walking along any portion of the Salton Sea is the dead fish that line portions of the shore. There are currently estimated to be 300 million to 400 million Tilapia that live in the Salton Sea. Some of the fish occasionally die off during the winter time when the water gets to cold and then during the change in seasons algae blooms are known to happen in the Salton Sea which cause issues with oxygen deprivation for Tilapia and can give off a foul odor. The Salton Sea is California’s largest lake. It is the third largest saline lake in the nation. The Sea has no outlet and its surface elevation is 227 feet below sea level. 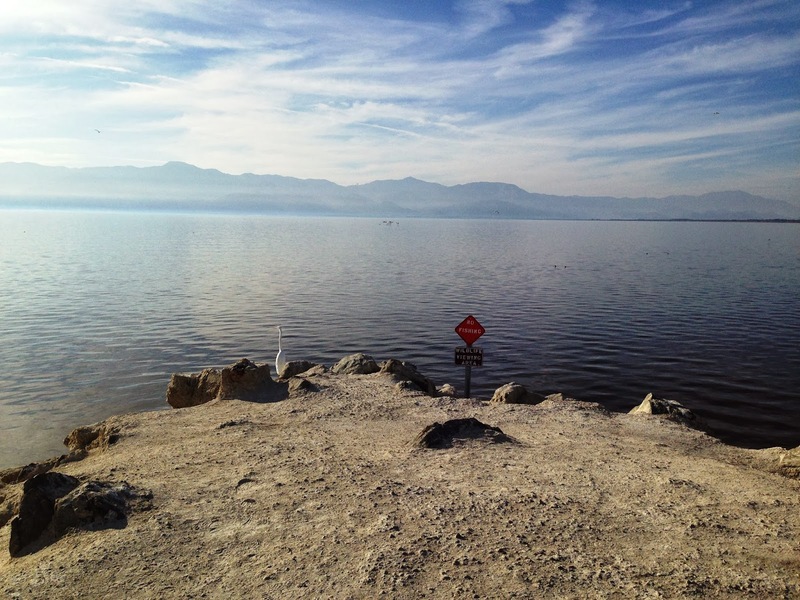 The average depth of the Salton Sea is 29.9 feet, its deepest is about 50 feet. The park is located on the Pacific Flyway, and 400 different species of birds have been counted at the Salton Sea--almost half of the 900 species known to exist on the North American Continent. During winter migration up to four million individual birds are estimated to use the Sea each day. There is a greater species variety and more individual species here than any other place in the nation. Unlike most lakes, the Salton Sea has no natural outlet flowing to the ocean; whatever flows in, including agricultural runoff, does not flow out. Water is lost through evaporation and through percolation into the ground. The Salton Sea was formed in 1905 when massive flooding caused the Colorado River to break through an irrigation canal headwork and flow freely into the Salton Basin for 18 months. Since then, the Sea's existence has been maintained primarily by agricultural return flows from the Imperial, Coachella, and Mexicali Valleys. Rating: Elevation Gain: minimal. (Easy), Distance: 2 miles (Mecca Beach) to 4.5 miles (Corvina Beach) (Easy). I just went to Salton Sea a few weeks ago. I didn't really like it but that might have been due to the temps being over 90 degrees and there was no shade anywhere. After reading your review I think I'll check it out again! I have been wanting to go to Salton Sea for months now and finally made a point of booking a Palm Springs trip just to hit this on the way back! Thanks for the extensive write up, it will definitely help guide my tour while I'm there!